Everyone ready for the holidays? I've discovered that the one bonus to traveling for Christmas means I'm actually ready for it a lot sooner than Christmas Eve. ;o) Been busy finishing up my shopping, wrapping, etc. Miss Faith is getting the Playmobil Egyptian Pyramid from us and Ben is getting the Trio Batmans. As for me, I'm looking at a couple of cute things from CSN. CSN Stores has over 200 online stores where you can find everything from stylish furniture, to a leather briefcase, or great cookware! I really want a trifle bowl, more fruit roll up sheets for my dehydrator, some books, and a Vera Bradley watch. I also never say no to cute Coach purses (currently carrying the adorable one Shaun got my last year, I have a wee bit of a thing for purses, actually more than a wee bit, it's kind of a vice). Mr. Ben had a snowman shaped sandwich--ham and onion/chive cream cheese on 7-grain honey bread, with a wee bit of carrot for the nose, two chocolate chips for the eyes, and a bit of homemade strawberry fruit roll up for the scarf. 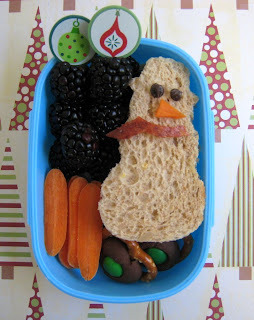 He's accompanied by two of Faith's Hershey Kiss pretzels, some carrot sticks and fresh blackberries on Christmas picks. So cute and I am intrigued about Faith's Hershey Kiss Pretzels! They are yummy and so easy. I bet C&M would like making them. Lay out mini pretzel twists on a baking sheet, top each with a Hershey's Kiss. Bake at 350 for maybe 5 minutes, remove and while still hot, press an M&M in the center of each. We did chocolate Kisses with red & green M&Ms and peppermint kisses (white with red stripes) with just the green M&Ms.